Has anyone noticed a subtle but highly logical change in Microsoft Dynamics GP 2013 menu structure? Field Service Setup menu was grouped under Project till GP 2010. The path to access Service, Return, Contract setup menus was Microsoft Dynamics GP -> Tools -> Setup -> Project; which quite honestly did not make any sense. You are accessing Field Service setup, but from under the name Project…!?!?!?!?!? Good folks at MSFT (and/or original developers of Field Service) might have sensed it, so now the setup menu items are logically structured under Field Service. I am happy to say the least. 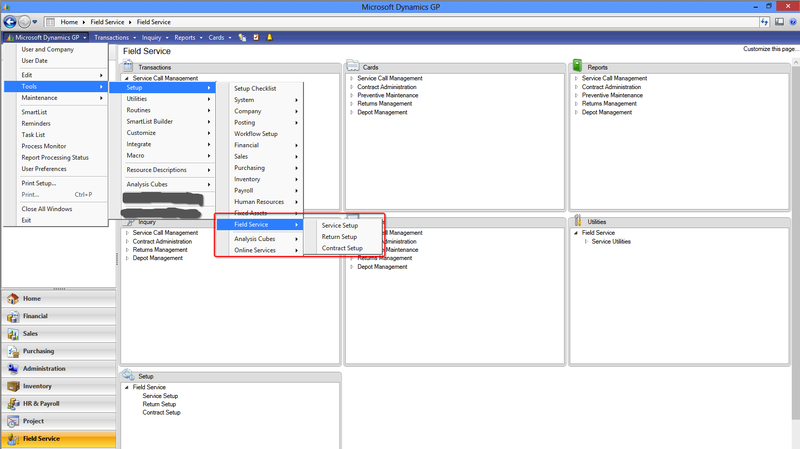 Because, if you want to access Field Service setup windows from GP home page, it was not possible till GP 2013. Now that’s also been fixed. Small change, but a BIG difference it has made. Thanks MSFT & Field Service Team, for this.